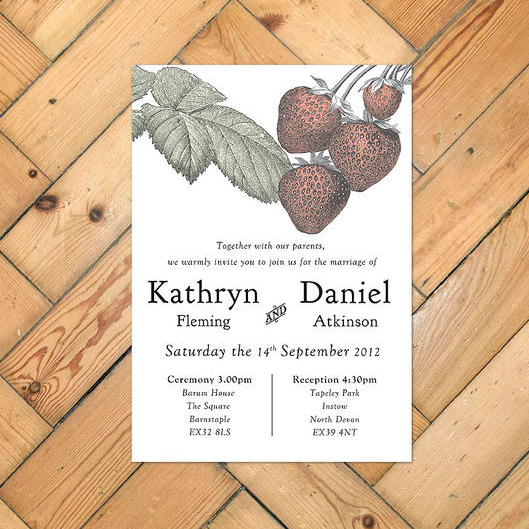 Beautifully illustrated with a detailed botanical sketch in muted colours, this design is simple and chic but still incredibly eye catching and memorable with its juicy depiction of four ripe and ready-to-pick yummy strawberries. The soft colour pallet gives an overall vintage effect which is right up our street and the choice of font effortlessly seals the deal with a touch of classic style. 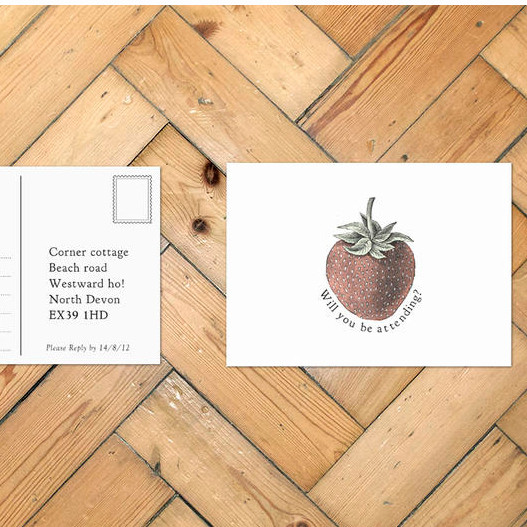 For those with a love of this great British favourite, or even those who tend to their own patch of strawberries in their allotment or garden, this invitation will speak many words to your guests – you love fruit (especially strawberries… hey, you might even be vegetarian or vegan! ); you love growing things; you’re very proud of the aforementioned allotment; you’re a fruit picker/grower and proud; you’re into fresh and organic produce; you love tennis; Devonshire cream teas with strawberry jam is a firm favourite; your nickname is strawberry chops because you were found in the garden stuffing your face with your Dad’s prized strawberries when you were five (true story)… there’s so many ways in which this design could be relevant to you and your beloved and this invite is a great way to add a further personal touch to your wedding!